Primary (baby) teeth might not last long, but their impact can last a lifetime. Their first set of teeth not only allows young children to eat solid foods, but also guide permanent teeth to form and erupt in the proper position. Unfortunately, primary teeth aren't immune to tooth decay. 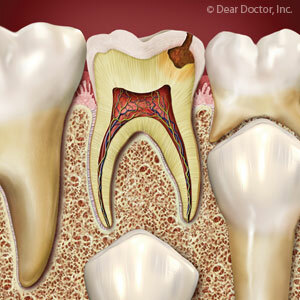 If the decay is extensive, the tooth may not last as long as it should. Its absence will increase the chances the permanent teeth won't come in correctly, which could create a poor bite (malocclusion) that's costly to correct. If a primary tooth is already missing, we can try to prevent a malocclusion by installing a “space appliance.” This keeps nearby teeth from drifting into the empty space intended for the permanent tooth. The best approach, though, is to try to save a primary tooth from premature loss. We can often do this in much the same way as we would with a permanent tooth — by removing decayed material and filling the prepared space. We can also perform preventive applications like topical fluoride or sealants that strengthen or protect the tooth. 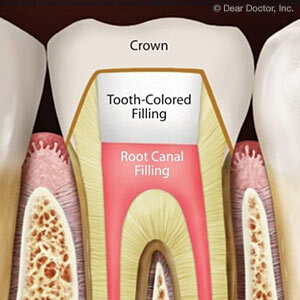 It becomes more complicated, though, if the pulp, the interior of the tooth, becomes decayed. The preferred treatment for this in a permanent adult tooth is a root canal treatment. But with a primary tooth we must also consider the permanent tooth forming below it in the jaw and its proximity to the primary tooth. We need to adapt our treatment for the least likely damage to the permanent tooth. For example, it may be best to remove as much decayed structure as possible without entering the pulp and then apply an antibacterial agent to the area, a procedure known as an indirect pulp treatment. We might also remove only parts of the pulp, if we determine the rest of the pulp tissue appears healthy. We would then dress the wound and seal the tooth from further infection. Whatever procedure we use will depend on the extent of decay. As we said before, our number one concern is the permanent tooth beneath the primary. By focusing on the health of both we can help make sure the permanent one comes in the right way. Primary (baby) teeth don't last long. But despite their short life span, they do a number of important things, like enabling a child to eat solid food. But perhaps their most important long-term function is “paving” the way for their permanent replacements. If one is lost prematurely, though, the permanent tooth might not come in properly aligned. That's why if a primary tooth is in danger of loss due to decay or injury, we'll do our best to save it. But that could get a little tricky if the infected or damaged part of the tooth is the innermost pulp. If it were an adult tooth, the best course might be a root canal treatment: access the pulp, clear out the diseased tissue, and then fill the space with a special filling. But with a primary tooth (or a young permanent tooth for that matter) that may not be advisable. That's because the pulp plays a more important role in a child's tooth than an adult's. Its nerves and other tissues stimulate dentin growth; a full root canal could disrupt that growth and weaken the tooth in the long run. With a child's tooth, we proceed carefully depending on how infected or damaged the pulp might be. If it's only slightly exposed or not at all, we try then to remove as much decayed tooth material outside the pulp as necessary, then apply antibacterial agents or dentin growth stimulators. If we do have pulp exposure, we'll try to remove only as much of the affected pulp as necessary through a procedure called a pulpotomy. This technique will only be used if the remaining pulp looks healthy or restorable to health. If not, we may need to perform a pulpectomy to remove the entire pulp. Most like a typical root canal, it's a last resort: without the pulp, dentin growth could be stunted and the tooth won't develop as healthy as it should. Of course, the best approach is to prevent teeth from developing such problems in the first place. So, be sure to practice effective daily hygiene with your child and keep up regular dental visits beginning at age one.